I sometimes get accused of being too libertarian. One leftist blogger even said my views are insane. So I decided to show my open-mindedness by finding a way to praise big government. It took a bit of head scratching, but I think I discovered something that is impressive, sort of. 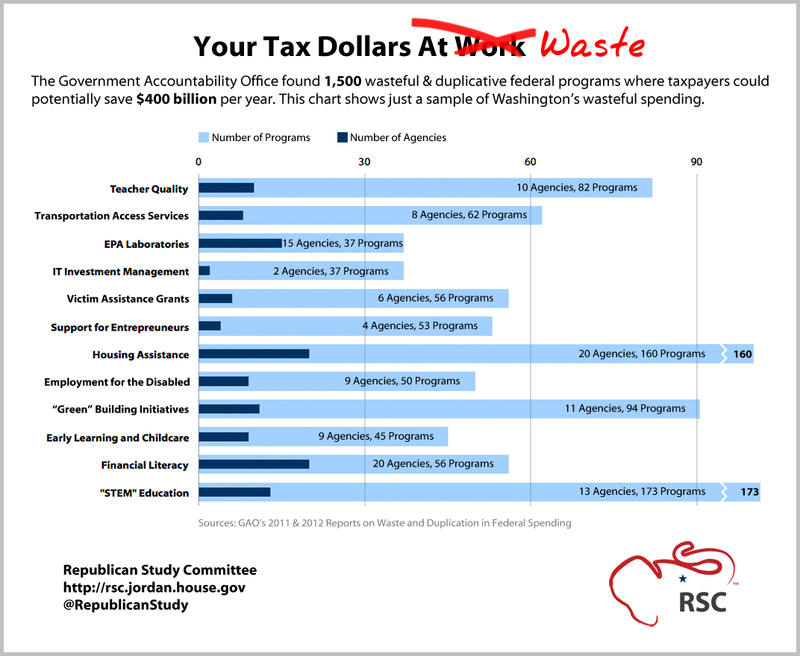 As you can see in this chart prepared by the Republican Study Committee, the federal government is remarkably effective at wasting money with duplication and featherbedding. But I don’t want to be chintzy in my praise of the federal government. If you look at the areas where there is the most duplication and waste, you’ll find programs for energy, housing, and education – all of which are areas where the Constitution does not authorize spending and intervention by the federal government. So let’s also praise the politicians in Washington for their agility in sidestepping the system set up by the Founding Fathers! And let’s not be shy about crediting the political elite for shoulder-to-the-grindstone diligence. It takes a certain dedication – or something like that – to continue to pour money into these programs when all the evidence suggests federal involvement in education has undermined outcomes, that federal housing programs helped cause the financial crisis, and that federal energy programs have become cesspools for cronyism. I know I’m guilty of sometime posting absurd examples of government stupidity. I hope today’s post shows that I’m capable of looking at the positive side of government. No dollar is ever wasted when supporting our troops. And they deserve more. A day of reckoning is on the horizon respecting the mauling of the Constitution by chronic offenders that haven’t a clue about a capitalist system. To them, truly, money grows on trees. A. Lincoln spent a considerable amount of time appointing people to posts that were open, and to his dismay, posts that did not exist were sought after. All of which demonstrated a determination by job seekers, not to serve , but to obtain a ticket to ride. The hackneyed expression that “to do the same thing in the same way, and to expect a different result, is a definition of insanity,” applies to government, not to the messengers that point out the absurdity. Reblogged this on Thoughts by Jamie.